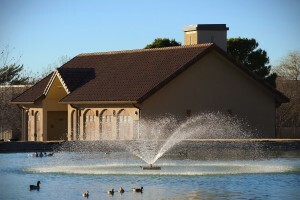 The Spiritual Center is a non-denominational facility that can accommodate religious services for campus and student groups as well as ceremonial events for the campus and the general public. Located west of the Educational Services Building, adjacent to the duck pond, it is a beautiful location for weddings and memorial services. When no events are scheduled, the center is open from 7 a.m. to 10 p.m. as an accessible space for reflection.